In 2018, the GeOnG had for main sponsor the French Development Agency (AFD). CartONG wished to promote its project EducAuRA, objective 2030 - implemented as part of the European programme "Frame, Voice, Report!" 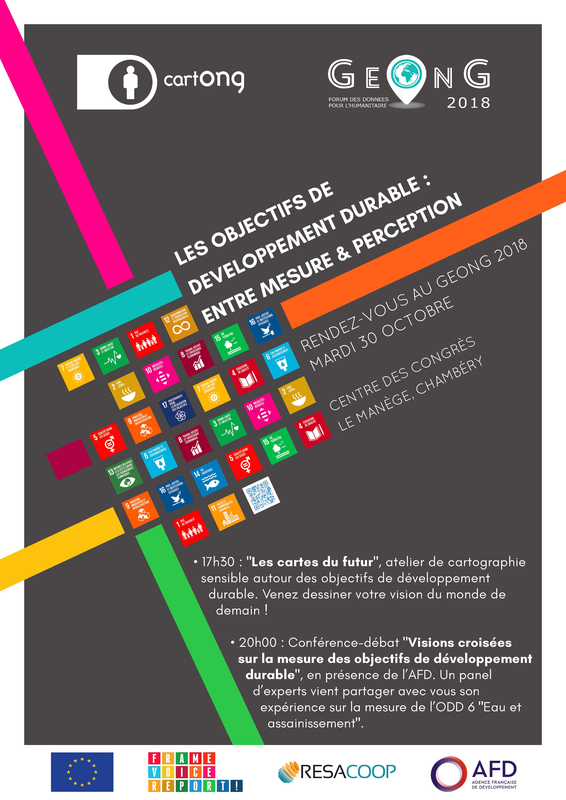 - which aims at raising awareness about the Sustainable Development Goals amongst the citizens of Auvergne-Rhône-Alpes - a theme often encounters in mainstream news coverage yet not well-known and understood by the general public. 17h30 - 19h30 - "Maps of the future" : CartONG invited the participatants for a sensitive mapping session - a subjective and creative approach of mapping. The workshop was led by CartONG and aimed to question the participants about their understanding of sustainable development giving them the opportunity to express their vision of our future world through drawing. 20h00 - 21h30 - Conference-debate "Interwoven stories on measuring progress towards the Sustainable Development Goals": a panel of experts debated and shared their experience about measuring progress towards the sustainable development goals, focusing on the ODD 6 “Clean water and sanitation”. During the 2018 GeOnG, the participants and the general public also had the opportunity to discover an exhibition called "When maps speak to us". This exhibition was born out of the desire of deconstructing stereotypes about modern international migratory phenomena through mapping. The purpose of the exhibit was to raise awareness and question the audience about their perceptions of migratory routes and their impacts in France, in Europe and in the world. We thank the European Union, the Frame Voice Report programme & RESACOOP, partners of EducAuRA, objective2030 for their support. Poster of the event available here.